You should curb your blood sugars when it comes to diabetes and portion control. Select the correct portion size and control your diabetes. Start by using smaller plates! This makes a huge difference when it comes to diabetes. You eat too much and gain weight and the blood sugar numbers go up. There’s a lot when it comes to addressing your diabetes and it has to do with portion control and I know that you are aware of what I’m talking about. Come clean now because I’ve been guilty too of portion sizes that are too big and that are not properly balanced. Raise your hand if your mom wanted you to be a member of the “clean plate club?” Me too! But that doesn’t mean to pile it with unhealthy foods and to heights where you can’t see your neighbor’s house! Okay, I exaggerated just a bit. 🙂 But the fact of the matter is that we should learn at an early age about portion sizes. Portion size is about losing weight too because that is a major factor with your diabetes. But it’s also about overall general health as well. Instead of the clean your plate club, let’s talk about the create your plate club,okay? It’s a very easy and effective way to set up your portions on your plate that will help you in losing weight and managing your blood sugar levels. The key here is to fill your plate with protein and starchy foods of smaller portions and larger portions of non-starchy vegetables. Size definitely matters when it comes to food portion sizes especially when it comes to type 2 diabetes. By controlling your portion sizes you are helping to control your blood sugar and diabetes. The portion size also helps you in managing your carbohydrates and your calories. By taking control of these you can lower your blood sugar and the end result is that you can possibly reduce your need for any diabetes medications. * Tape measure your food- Okay, just kidding about the tape measure, but do measure your food. Get yourself a small food scale and some measuring cups. After a while you’ll be a master at it you can just eyeball it and you’ll be good to go. It takes time but you’ll get the hang of it. This is important. Do it! This doesn’t mean you have to bring anything to measure at a restaurant or a friend’s house for lunch or dinner. It might be a bit tricky in the beginning but don’t be concerned. * Slow down- Be careful because there’s a cop at your dinner table with a radar gun! But really, there’s no race here at all. Do not keep serving dishes on the table to tempt you for second or third helpings. A great tip is to chew slowly and put your fork down in between bites. When you’re finished eating, stop a relax before getting up for more. You should be full with the servings you had. Now that we have the proper size plate, with diabetes you lose more weight than those who just eyeballed their meals. So the rule of thumb here is that you want to fill up half off your plate with vegetables that are non-starchy, one quarter with lean protein, and the last quarter with grains. * The distractions- How common is this? When I was growing up the only thing that could be distracting was the TV and we weren’t allowed to have it on during dinner time. But now that are SO many distractions with TV, cell phones, laptops, tablets, and 40 million other gadgets that we aren’t focusing on our meal. It’s very important to pay attention when we’re eating and not be distracted. * Read the labels- Food labels hardly ever existed way back when but they do now and it’s crucial that you read them thoroughly. They are updated and a lot more accurate than ever before. Always look at the servings size on the label! Nutrition is important and this is where you’ll find it. * Keep track- There’s a lot of value in keeping track of your food intake and once you’ve mastered it, then it becomes much easier because you will know what to eat and just how much. Research revealed that people and diabetics in particular who track their food intake lose twice as much weight as those who do not track their food. But why else is this even more important? Because by logging your food intake you are helping to control your blood sugars and as diabetics that’s what you want! * Dining out- You’re not allowed to eat out anymore. Just kidding! But you have to be smart about it. Start out at home when it comes to measuring and then when you are experienced at it you can then use that knowledge in the restaurant. Many restaurants today have calories and nutrition facts listed on their menus. Take full advantage of this. 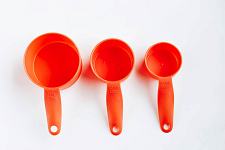 You must be aware that restaurant servings are much larger than you will be used to. So choosing and making adjustments are a given here. It’s not the easiest thing when dining out and when you have to watch your portions and the way restaurants serve you. Combo meals should be avoided but even a typical meal serving is oversized. One good idea would be to split a meal with your partner or whoever you’re with if possible. Practice makes perfect and eventually you will get it right. * Water- First of all you need to drink 6-8 eight ounce glasses of water everyday. But by drinking one of those full glasses before you eat, will help to fill you up somewhat and cause you to eat less than you normally would. * Making you work- This is an excellent tip for causing you to slow down when you eat. Choose foods that make you “work” by having to peel, unwrap, or shell because it takes more time and a bit of work to get to the food such as pistachio nuts, oranges, walnuts, and grapefruits. Well, you get the picture. * Avoid skipping meals- Skipping meals isn’t a good idea and it can make your stomach rumble more than a freight train coming down the tracks. The result will be gorging yourself and that’s the last thing you want to be doing. To avoid overeating, find something with fiber, healthy fat, and protein to eat every few hours or so and this will help you with eating too much. * The “hands” rule- You may run into issues sometimes when you are putting together your meal or even a snack. Remember the hands rule: 1) The correct size of pasta or rice is about the size of your fist. 2) One serving of fat should only be about the size of your thumb. and 3) Lean meats should match the size of the palm of your hand. Got it? Good! * Keep your choices limited- Sometimes measuring and thinking about it can be rather difficult for some folks, so try having a much smaller variety of foods on hand in your house. This actually can work by helping you from straying and overeating. The reason this works is because by having too many options of foods to eat will really weaken your ability to resist those extra foods. * Nut scoop- I’m not a huge nut eater but if you are, you can really go “nuts” about nuts and overindulge for sure. 🙂 Investing in a nut scoop is a wise choice and here’s why: 157 calories in only 17 cashew nuts; 100 calories in only 15 almonds. Most folks will eat more than 3-4 times that amount and that’s not good for blood sugar or weight loss. The nut scoop is your counter and will keep you honest! 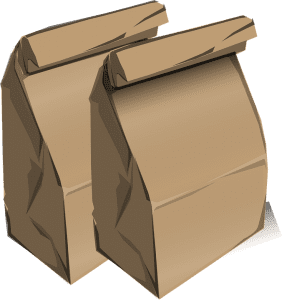 * The old brown bag- Folks who brown bag it a lot tend to lose more weight than those who don’t. In a study done, those who ate out once a week lost less weight. You lose more control when you’re eating out in a restaurant. If you pack your lunch in a container, you can pack your protein and vegetables and choose the foods and portions wisely each day. * The scene for eating- It can make a difference if you actually “set up the scene” before sitting down to your meal. If you have peace and quiet by dimming the lights and having some relaxing music it will help you to enjoy your meal more and keep your portions lower as well. Chew slowly, remove the fork between bites, and drink water before, during, and after you eat. Now you know the connection between diabetes and portion control. It’s something that can really make a difference for you when it comes to losing weight and controlling those blood sugars. It isn’t that difficult once you get the hang of it and you’ll be thankful you did. If you have any questions or comments, please feel free to leave them below and pass this on to others who may need help. I would appreciate it! Thank you for reading and have a happy and a healthy one! Stay healthy! The Key to Vitamin C and Diabetes-Here’s the Truth About Vitamin C in 5 Minutes! I absolutely have to agree with you on your recommendations of portion control and of course it makes sense not to overload our body (and hence organs) with more than we need. Unfortunately in today’s world eating junk food in large portions is the norm – and sadly often cheaper, and definitely easier, than cooking something fresh and healthy at home. If your website manages to save one person from diabetes, and I am sure it will, then you will have done a great job. 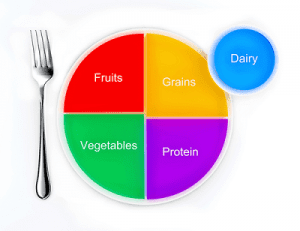 Of course it’s important to eat healthy groups of foods but not in oversize portions and portions that are not balanced. Eating healthy is what we need to do but we should be aware of just how we are eating and how much as well. The purpose of this website is to help others with type 2 diabetes in lowering their blood sugars and to also prevent others from developing type 2 diabetes. Here’s to the Create a Plate Club! Way to go on this this guide on portion control. I didn’t really understand its value until you were able to break it down here for all of us to understand. Great job Rob, I really do enjoy your website and hope you continue to make great content in the future. Keep up the good work. Thanks and it’s important for us to know about portion control when you are a diabetic. I feel that once we know how to control our portion sizes and how to balance them out properly, it can turn things around for diabetes. It’s not hard once you learn it and it will become an important part of your meal planning and how get on the road to better health. Informative and useful post. It addresses a very serious issue – lowering your blood sugar by controlling your food intake. the post contains a comprehensive review of different methods which we have to follow in order to stay healthy. Tips for portion control are very interesting and practical. As for myself, I am going to implement some advice. What I like most is the way how this very serious topic is delivered. Good sense of humor. Nice. Thank you so much for saying. It’s important to know that portion sizes make a big difference when it comes to losing weight and diet control. These are essential tips that will help in controlling your diabetes as well. And I do try and have a sense of humor.